Lodge St. Patrick was delighted to be a part of the group of sponsors for the Otago Search and Rescue’s (SAR) inaugural tracking competition - believed by many to be the first of its kind in the southern hemisphere, if not the world. A long-time SAR supporter, the Lodge supplied an engraved cup for the winners of the Novice Division, while two of our members also performed ‘back room boy’ role during the event. The contest was acknowledged a big success, attracting competitors from as far away as Hamilton, while two search and rescue teams from the police also took part. It now seems certain that the event will become a regular national fixture on SAR’s calendar. The competition proved its importance because it added a new dimension to the learning of the trackers involved. LandSAR Chairman Dave Robertson informed us, “Under normal circumstances SAR personnel attend workshops and familiarization courses, self-train and go out and practice what they have learned. Dedicated as they undoubtedly are, they strive to develop techniques and advanced skills to be become more proficient and effective. Nevertheless, regardless of what level the tracker is at there is forever something new to learn, so there is a continuous need for constant revision, repetitive training and, at all times a necessity to revisit the basic skills. “The problem is, unless they are attending a lot of SAROPs (operations) or SAREXs (exercises) individual or team skills cannot be measured against current standards or the skills of other groups. Nationally the SAR teams and individuals are working in a bit of a vacuum with little scope for hands-on interaction or discourse. Generally they don’t get the opportunity to mingle with other like-minded people except within their own group - nor expand their experience beyond their own pre-allocated boundaries. One of the ‘Advanced’ tracking teams is helicoptered to the last known position of their ‘target’. “Through healthy competition the tracker’s skills can be tested before they are needed for real. Accordingly this also focuses the trainers to develop and adapt their training to meet the ever changing requirements of all SAR’s stakeholders. 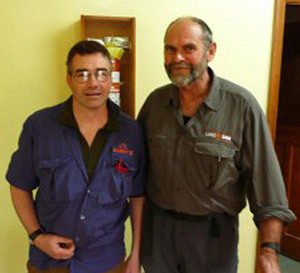 Legendary SAR tracker, Nick Coyne (RIGHT), is pictured with the organiser of the competition, Paul ‘PK’ Kelly, a well-known SAR instructor. The final prize giving was attended by New Zealand search and rescue legends, Ross Gordon and Nick Coyne, who presented the trophies to the successful teams. Both Ross and Nick announced that were impressed overall by the way the exercises were devised, and the event executed and run. Dave Robertson was fulsome in his praise for all the sponsors. These included: Alan Millar’s Hunting and Fishing, Bivouac, Central Radio Services, the Department of Conservation, Emerson’s Brewery, Kathmandu, Mitre 10, NZ Wilderness magazine, Otago Community Trust, Swazi, Vodafone and, of course, Lodge St. Patrick. 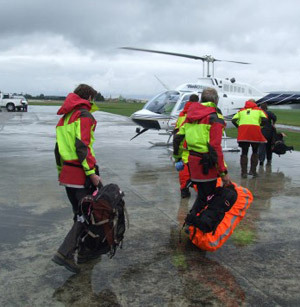 We look forward to 2013’s SAR tracking Competition and hope that it will be bigger and better still. 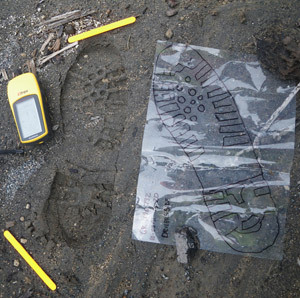 The event was hosted by the Dunedin Tracking Group (DTG).